The all new and updated version of Karen’s book is now available. It has recently been added as an Alzheimer’s/Dementia Resource Book with the National Institute of Health (NIH). It may be a relatively little book, yet it's big in terms of in-depth information! Ideal for both individuals and professional caregivers, it's available for a limited time for just $11.95 per book, which includes postage and handling. To Admit or Not to Admit to a Home? 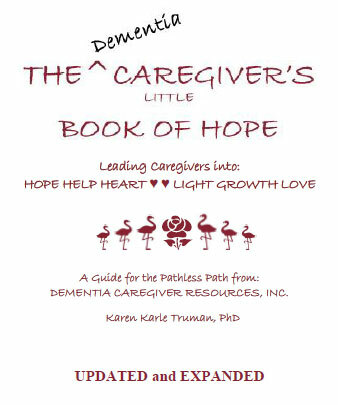 "This Little Book of Hope has seen me through the very difficult days of caregiving for my wife. Without this 'Bible' as guidance, my journey would have been much harder."